Whether harvested early for scallions (green onions), for summer meals, or winter storage, onions need rich, well-drained soil and good weed control. Tightly spaced green onions fit well in ornamental plantings. Well-drained, rich soil, high in organic matter, neutral pH. Optimum pH is 6.2 to 6.8. Requires plentiful, even moisture for good yields. Easy if you have rich well-drained soil and good weed control. Usually does not flower unless grown from sets that are too large (more than � to � inches in diameter), or young plants (direct seeded or transplanted) are stressed by abnormally cold weather. not native to North America - Unknown in wild. Probably originated in the Middle East or Asia. Propagate by seed - To grow your own onion sets, sow seeds thickly in a block in midsummer. About 2 months after planting, roll down the tops, forcing the plants to form small bulbs. (Those about the size of a dime work best.) After tops dry, clip them off, leaving about � inch of stem. Cure and store in a cool, dry place as you would onions for eating. Plant your sets the following spring. Seed can be saved 1 year. - Longer if stored properly in cool, dry location. Can be direct-seeded, grown from transplants started inside, or from sets -- small bulbs about �-inch in diameter grown from seed the previous season. Choose a weed-free, well-drained location. Raised beds are ideal. Onions are good for intercropping with other garden plants, especially early-maturing spring greens. Do not plant where other onion family crops have been grown in the past 3 years. 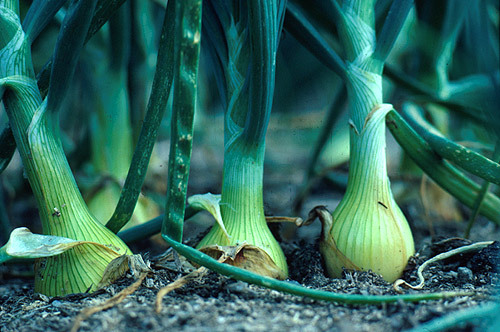 Direct-seeding in the garden may not allow enough time for long-season varieties to mature, but is fine for shorter-season varieties or for scallions - onions harvested before the bulb forms. Direct-seed in spring when the soil reaches 50 F. Plant seed � inch deep, � inch apart, in rows 12 to 18 inches apart. Thin to 4-inch spacings for large bulbs, 2-inch spacings for smaller bulbs but higher yields, or 1-inch spacings for scallions. Start transplants inside about 8 to 10 weeks before last frost date. Plant 4 or 5 seeds in each cell, or seed in flats � inch deep and � inch apart. If tops grow too tall and begin to droop, trim back to about 3 inches tall with scissors. After hardening off, transplant 2 to 4 weeks before last frost date. Space 4 inches apart for large bulbs, 2 inches apart for smaller bulbs, or 1 inch apart for scallions. From sets: Choose bulbs no larger than � inch in diameter. Large bulbs are more prone to bolting. Plant sets about 1 inch deep 2 to 4 weeks before last frost date. Space 4 inches apart for large bulbs or 2 inches apart for smaller bulbs. Onions have shallow root systems and need consistent moisture and good weed control. Water weekly if weather is dry, and mulch to retain moisture and suppress weeds. Onion maggot - Locate new plants in a part of the garden different from previous year's location. Use floating row covers to prevent infestations. Purple blotch (Alternaria porri) and Botrytis leaf blight - Avoid wetting foliage if possible. Water early in the day so above-ground plant parts will dry as quickly as possible. Avoid crowding plants. Allow space for air circulation. Eliminate weeds around plants and garden area to improve air circulation. Practice plant sanitation: when plants are not wet, carefully remove or discard affected plant parts. In autumn, rake and dispose of all fallen or diseased leaves and bulbs. 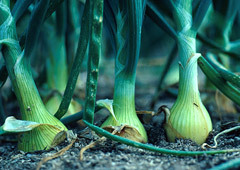 Browse onion varieties at our Vegetable Varieties for Gardeners website. Choose long-day varieties which need about 14 hours of light to form bulbs. Short-day varieties, such as the famous Vidalia onions, grow best in the South. Spring-sown early varieties can be harvested just 60 to 80 days after planting. Storage varieties require 90 to 110 days to mature from direct seeding, and come in yellow, white and purple varieties. Sweet or milder varieties do not store well, and should be eaten soon after harvest. Pearl onions (sometimes called cocktail onions) have small bulbs (great for pickling) that mature in 60 to 70 days. Green or bunching onions (sometimes called scallions) don’t form bulbs. Harvest them for their greens and small blanched below-ground stem usually 65 to 75 days after direct seeding. Some are a different species altogether, Allium fistulosum.